A lot of us moms probably have a slow-poke turtle toddler (or older kid) in our house. Here's a like-minded pal to hang on the fridge. Invert the plate and glue on scraps of tissue paper. Cut out a head, legs and a tail to glue under the plate (aka: the turtle shell). You have a green turtle!! Your toddler will love slopping on the glue and some tissue paper squares and be so proud! 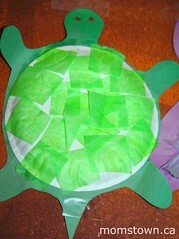 Bigger kids can make a fancier turtle with more tissue paper or layer with construction paper for a tougher "shell".